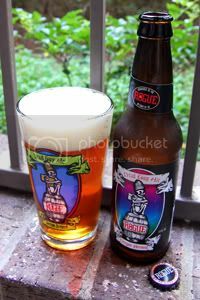 Dead Guy is Rogue's flagship beer, and one of the most ubiquitous brews in the craft world. The dead guy logo was originally designed as a tap sticker in honor of the Day of the Dead, but it proved so popular that Rogue applied it to their Maibock. The Maibock, or Helles Bock, style is a strong German lager brewed for consumption during spring. According to the BJCP, it can be thought of as "either a pale version of a traditional Bock, or a Munich Helles brewed to Bock strength." Not just a catchy label, Dead Guy has won a slew of awards, including nine medals from the World Beer Championships. The backbone is built of Northwest Harrington, Klages, Maier Munich, and Carastan malts, Perle and Saaz hop varieties provide bitterness, and fermentation is provided by Rogue's proprietary Pacman Yeast. Rogue describe the beer as "deep honey in color with a malty aroma and a rich hearty flavor." Sounds good, let's crack it open and pour it into my handy Dead Guy pint glass. Appearance: A slightly hazy, golden-amber body capped by two fingers of creamy, off-white head that endures well and leaves good lacing. Aroma: Lots of toasty caramel malt with a dash of spicy hops. Taste: The focus here is really the bold and toasty caramel malt backbone, which is spot-on for the style. Towards the end a mild alcohol character emerges, about equal to what you'd expect to find in a Bock. It finishes with earthy and subtlety spicy hops that help to dry everything out. Mouthfeel: A medium, slightly creamy body that features moderate carbonation. Drinkability: Just shy of session territory, but still very drinkable. Verdict: Dead Guy is a tasty and very drinkable beer with lots of character, but falls short of being exceptional. A worthy flagship brew for one of the bigger American microbreweries.